The great strategist Sun Tzu advised that if you know yourself and know your enemies, you will win every battle you fight. Hence, before we practice counters against Kick-Boxers, it is wise to understand how Kick-Boxers usually fight. Sifu Anthony Korahais demonstrates some widely used Kick-Boxing attacks. In order to learn them systematically, Grandmaster Wong asks that these common attacks be formalized into standard routines. Of course, when Kick-Boxers attack in free sparring or real fighting, they don't do so in fixed routines. But practicing routines instead of randomly saves a lot of time. When we are familiar with the routines, we can systematically release control so that eventually the attacks can be random. Having learnt how to handle Boxers, we progress to learning how to handle Kick-Boxers. The great strategist, Sun Tzu, advised that if you know yourself and know your enemy, you will win every battle. So, first we have to know what the common Kick-Boxing attacks are. Sifu Anthony shows some examples. How would you counter such attacks? Sifu Anthony demonstrates some common Kick-Boxing attacks. To make training systematic, Grandmaster Wong asks Sifu Anthony to standardize some Kick-Boxing attacking routines for training purpose. The first Kick-Boxing routine is a left round-house kick, a right cross and a left elbow strike. 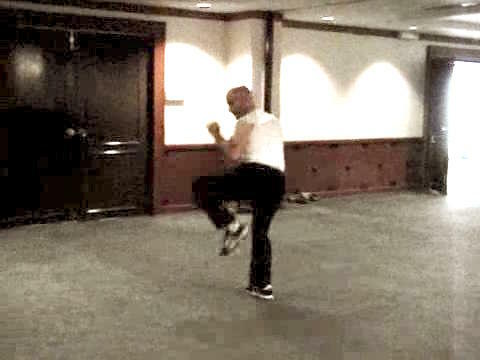 Sifu Anthony shows another routine a Kick-Boxer would use in his attack. It consists of two jabs and two thrust kicks. Of course in a real fight, an opponent who uses Kick-Boxing may not use the same routine, but standardizing a routine for training is a systematic way to practice. Sifu Anthony shows another Kick-Boxing routine, which consists of a left back fist, right side-kick and a right cross. He also reviews the two other routines. Kick-Boxing techniques are not many. Knowing these attacks will give us some good foundation for combat training against Kick-Boxing. Here is a fourth routine. It starts with a left jab, followed by a left side-kick and then a right cross. These attacks are like those in Shaolin Kungfu but without the advantages of Shaolin Kungfu. Do you know what these Shaolin advantages are? Standardized Routines of Kick-Boxing Attacks from Wong Kiew Kit on Vimeo.